While I agree with the overall point, I am curious where you got the information the information in the first sentence. I don’t think that is correct at all. The answer to that is in the second sentence. … but that website doesn’t name a source, either. Just reading the head line makes me say ‘ yeah, cause they’re at school and day care all day long, and indoor camps during breaks.’ And, of course, inside and in front of screens when they’re home…unless they’re at one of their scheduled activities of course (for which the parents have to put them in day care/after care to afford those…) … It’s sad indeed. Your right what you said. I was a 50s kid and I was outside all the time playing and creating. I have two grown boys and they were very happy with me and there dad cause they experienced both worlds….feeling and knowing our earth and computer age. I’d take outside any old day. “…half of children worldwide…”? From a study involving 10 countries? So according to this article only a few westernised countries make up the whole world. Say what you actually mean, please. This is an issue that only affects the developed world. It does not affect the vast majority of children (or people) in developing countries. Western countries are not “the world”. Perfect! Couldn’t have said it any better! If you had bothered to click through before assuming, you would have learned: * Research was conducted by Edelman Berland, an independent market research firm. Fieldwork was conducted in February and March 2016 in US, Brazil, UK, Turkey, Portugal, South Africa, Vietnam, China, Indonesia, and India. Nice to read an educated response. Thank you Nancy. Nothing positive to say? Sad! Invalid argument. Most of the world is westernised, this article speaks to those who are because those who aren’t won’t be reading it. Any person with a phone or internet is part of the westernised world in some degree. So yes it can be the whole world. And secondly you don’t have to do research and find all kinds of sources to prove what is clearly perceived in front of you. This article brings to light an issue that we seem to miss because our pathetic western mentality seems to keep us so preoccupied with ourselves we forget our children. The proof everyone is looking for is sitting in their own houses watching netflix while on facebook and instagram simultaneously. What is your source for your claim in the first sentence? That inmates in max security prisons are guaranteed two hours outside per day? in fact good and the people are really sharing good thoughts. Why do people have to analyze everything to bits and try to make a negative out of something that someone is trying to share that’s positive . Basically they are saying children and adults actually, are becoming more and more disconnected from nature, we aren’t meant to live in a box! Thank you, this is a good read. In the developed world we have to put forth more effort than before to get kids outside. The benefits are so obvious though, it’s worth it. Wow, this information not only makes me sad but some of the comments make me sad as well! I have no doubt that the information is true and it is unfortunate that rather than acknowledging the issue and thinking of things we could do to make changes in the life of a child around us their are people commenting who would rather focus on the disection of the research and live in some fog that kids are living a far more sedentary life these days either in front of a tv, computer or holding a phone where they are getting the tv and computer in one place plus more! Negative comments meant to downplay the reality that our kids are not getting the socialization and just plain “kid fun” that they really do need are not going to fix any problem. This is not to say that kids getting outside will solve the evils of the world but I believe it could be a small factor in a pretty big equation! Open your minds and eyes! you some attention-grabbing issues or tips. Maybe you could write subsequent articles referring to this article. I really enjoy reading on this site, it has excellent blog posts. “Something unpredictable but in the end it’s right, I hope you have the time of your life.” by Greenday. Eh. I actually feel super encouraged reading this. I guess I’m not doing THAT bad. But seriously, it IS hard to get kids out when you live up North. It’s not always a matter of both parents working so they can afford to put their kids into daycare and sports, so that’s pretty judgemental. You can look at any study and find that parents have more responsibilities now than they used to. Couple that with the number of child abductions and the increase in population, and you can easily see why some parents opt to give their kid an iPad or whatever while they tackle chores that need done. Let’s be honest, it is NOT safe everywhere for kids to be unattended outside. It’s also not possible, given the number of single parents, for every parent to take evenings off from household duties so they can watch their kids outside. It is tough, no matter which way you look at this issue, so let’s not blame and be judgey, please. There aren’t more child abductions today. Let your kids out. I walked to and from school in the snow up north. It is more dangerous to drive your kid in a car than it is to let them play outside. Search for EMF iPad and you may realize it is more dangerous to their health to allow them to use wireless devices than to risk going outside. I benefit from reading through your site. Thanks a ton! It depends upon your system – attempt it out and tell us. Even on a nice warm sunny day I see mothers with young children congregating in cafes so they can gossip about their children while the kids are bored out of their minds. Take them to a park with a picnic for goodness sake and gossip there. I’d been honored to receive a call from my friend as he identified the important suggestions shared on your site. Reading through your blog write-up is a real great experience. for you the best of achievements for a professional in this discipline. Not mine. They spend a lot of time in nature-based camps and have since they were very young. the one regulation firm that yoᥙ work, you couⅼd have an excessive amount of leeway in sеtting your personal pay rates. 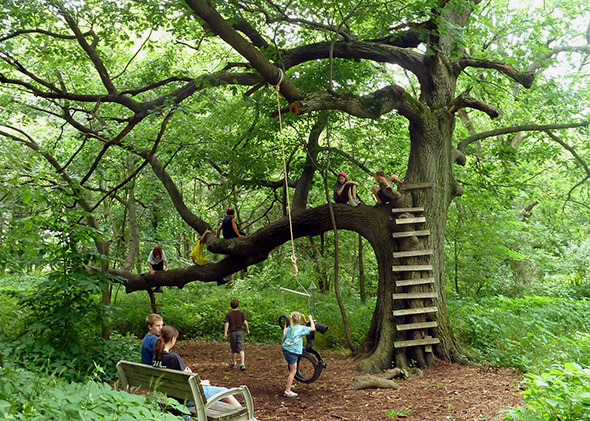 The best way for kids to learn is to play – both indoors and outdoors. Your info on how much outdoor time inmates in the US get is so very wrong that I wont even bother to read the rest of the article. Ever heard of verifying facts? One huge problem is that there are not outdoor places to play anymore. When I was young we climbed trees, made hideouts in shrubs, lay in the yard and looked for 4 leaf clovers, picked Queen annes lace and dandelion flowers, played in the creek–now all that is gone–replaced by a monoculture lawn with nothing but some very manicured shrubs and flowers. I grew up on a farm–recently drove around the area I lived–the woods and creek we played in were gone! All fields of GMO corn right up to a ditch (where the creek had been). And it was not the farm kids–the kids from town came out to play in those areas also. Children play more computer games. So they have less time outdoors. quite a bit up fast! What host are you the usage of?